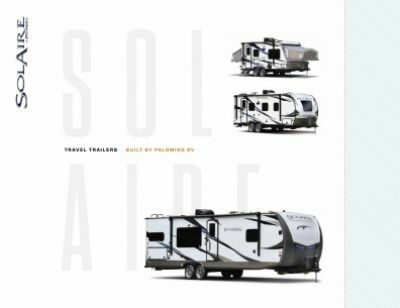 Bring home the 2019 Palomino SolAire eXpandables 185X Hybrid Trailer and save $1000s when you do! National RV Detroit has been selling the best RVs in the world in the Detroit area and beyond since 2008 at unbeatable wholesale prices! Come in today and let us help you find the perfect RV for your family! We're conveniently located at 44700 N I 94 Service Dr Belleville Michigan 48111. Don't live in the Belleville area? No worries. We offer personalized phone and internet service and 24/7 delivery anywhere in North America! So call us today at 734-439-3400 and we'll make your RV dream come true with a deal that will amaze you! You can hit the road for a faraway trip in this RV! It has a sturdy GVWR of 5630 lbs. and a hitch weight of 444 lbs. Protect your family from the elements with the reliable 15' 0" awning! You want to make sure your family eats healthy, nutritious meals when you're on vacation because you know the importance of a good diet. You'll have no worries in the Palomino SolAire eXpandables 185X, thanks to the modern kitchen it features! With its handy 3 burner cooktop and other cooking appliances, you can whip up delicious hot meals morning, noon, and night! And you'll store all those fresh, healthy foods in the 8.00 cu. ft. refrigerator! You'll be able to clean, drink, and cook with plenty of water from the 50 gallon fresh water tank!